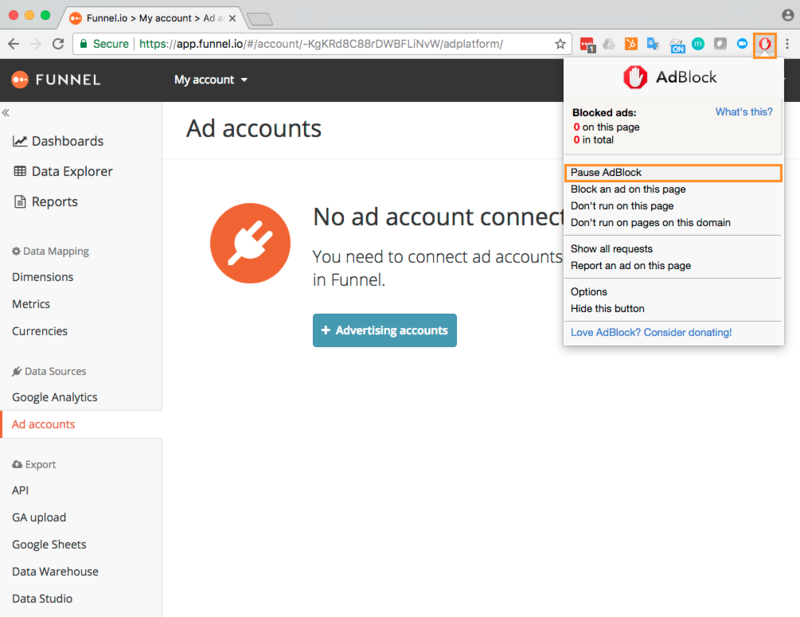 When connecting ad accounts and Google Analytics views in Funnel, a new window is opened with the connection dialog. It's therefore important to ensure that your ad blocker is disabled or has whitelisted all Funnel domains. If using "AdBlock" you should notice that the icon in your browser changes to a green 'thumbs up' and the status is set to paused. You should now be able to connect new sources to Funnel as expected. The first domain applies to the Funnel app whereas the second domain applies to the connector window. This means that you'll need to ensure both domains are whitelisted so Funnel works as expected. If you're still receiving this error after following the steps above, we would suggest removing the ad blocker extension completely or try using another browser.